There are many investment options available in the market to help you to claim a tax deduction. You can make many tax saving investments in order to get a tax deduction. Equity Linked Saving Scheme or ELSS is a mutual fund that helps you to save the tax. The majority of money is invested in equities in Equity Linked Saving Scheme funds. Many people think that it is risky to invest in these funds because they are equity oriented and involve major risk. But they forget to understand the fact that other investment options which involve higher risk also promise higher gains or returns. Investment and tax experts recommend investing in ELSS funds as they help you to get a tax benefit and earn a higher return. 1. The lock-in period for Equity Linked Saving Scheme or ELSS funds is 3 years. It is not possible to exit ELSS schemes before the completion of 3 years. The lock-in period of ELSS funds is better than other tax saving investments. 2. There is no entry or exit load in case of Equity Linked Saving Scheme or ELSS funds. 3. The investment in Equity Linked Saving Scheme or ELSS funds can be done via online medium or offline medium. 4. The most signification feature of ELSS funds is that they have provided highest returns to the people in comparison to all other tax saving investments. 5. ELSS funds are equity-oriented which help you to earn good returns in the long term. The equity-oriented assets involve a great risk and also promise higher returns among all tax saving investments. Most of the ELSS funds make an investment in diversified equities including small cap, mid cap, and large cap. 6. ELSS schemes are divided into two categories including dividend schemes and growth schemes. The regular dividend is provided to investors in case of dividend schemes. It is important to know that dividend earned from Equity Linked Saving Scheme or ELSS funds is taxable according to the tax bracket. 7. The minimum amount that can be invested in ELSS funds is Rs. 500 per month and the maximum amount has no limit. Though, you will be eligible for tax benefit only on the maximum amount of Rs. 1.5 lakh. 8. Top ELSS funds expense ratio varies from 2% – 3%. 9. The best thing about Equity Linked Saving Scheme or ELSS funds is that you have the flexibility to make an investment. You can make an investment through an SIP or in a lump sum. A lock-up period is also known as a locked up period. Before the completion of this period, you cannot redeem the amount invested by you. People should invest in Equity Linked Saving Scheme or ELSS funds as they have lowest lock-in period. There are plenty of options for tax saving investments. But none of the options have such a lower lock-in period similar to Equity Linked Saving Scheme. The lock-in period for Public Provident Fund is 15 years. When a person makes an investment in the National Pension Scheme and the Employee Provident Fund then the person has to make the investment till he or she retires. There are some other investment options also such as Fixed Deposits. The lock-in period for fixed deposits is at least 5 years. The lock-in period for ELSS is only three years. This means that you can easily redeem the amount that was invested by you after the completion of three years which is the lock-in period of ELSS funds. So Equity Linked Saving Scheme is one of the best tax saving investments for making an investment. Investment and tax experts recommend people to invest in ELSS funds because of various reasons. The biggest reason is that there is no maturity date for Equity Linked Saving Scheme or ELSS funds. You can invest in ELSS funds even if the lock-in period has ended. You can make the further contributions if you want as there is no compulsion. The best thing about investing in this investment option instead of other tax saving investments available is that you keep getting returns on the amount invested by you even if you do not contribute further. Another benefit of investing in Equity Linked Saving Scheme is you can stop investing whenever you wish as there is no compulsion regarding this. That is why Equity Linked Saving Scheme is considered as one of the best tax saving investments in the Indian market. In the case of ELSS funds, there is a professional fund manager who helps to make the best investment choices for you. You can easily put your money in more than one Equity Linked Saving Scheme fund depending on your requirement. In ELSS funds, you can diversify across investment styles and fund houses by investing in more than one ELSS fund. If you find that any fund is not performing well at any time then you can choose to stop investing further in that particular fund and select another fund which is performing quite well in the market. There are some more advantages of investing in Equity Linked Saving Scheme funds. The long-term returns that you get from ELSS funds are tax-free as the majority of money is invested in equities in Equity Linked Saving Scheme funds. So you need not pay any tax on the long-term returns from ELSS funds. That is why you should give preference to Equity Linked Saving Scheme in comparison to other tax saving investments. In ELSS funds, it is mandatory to make the majority of investment in equity-oriented instruments and equity. If you would look at all the tax saving investments then you will find that ELSS funds have the highest equity allocation. Equity is the only asset class that can help you to earn higher returns beating inflation. Equity might not give you good returns when you invest for a short run. On the other hand, the returns that you earn in long term in equity are higher than all the tax saving investments. So you are good to go with this investment option among all the tax saving investments. If you are planning to make an investment in Equity Linked Saving Scheme or ELSS funds through an SIP then it is one of the best decisions. Systematic investments allow you to invest a fixed amount of money every month. SIPs save you from investing a big amount of money after the completion of the financial year in order to meet the requirement of section 80C of the Income Tax Act. You can easily invest a small amount of money every month and avail the same tax benefit for which you are eligible after the completion of the year. That is why Equity Linked Saving Scheme is one of the best tax saving investments for making an investment. Equity Linked Saving Scheme or ELSS is a tax-saving mutual fund. It is an equity-oriented investment which means the majority of investment is made in equity. Dividend schemes and growth schemes are the two categories of Equity Linked Saving Scheme or ELSS funds. If you are looking for an investment option with no maturity date and short lock-in period then Equity Linked Saving Scheme or ELSS is one of the best investment options available for you in the Indian market. Equity Linked Saving Scheme or ELSS funds do not have an entry or exit load. Top ELSS funds expense ratio varies from 2% – 3%. 7. The minimum amount that can be invested in ELSS funds is Rs. 500 per month. The maximum amount has no limit. Though, you will be eligible for tax benefits only on the maximum amount of Rs. 1.5 lakh. 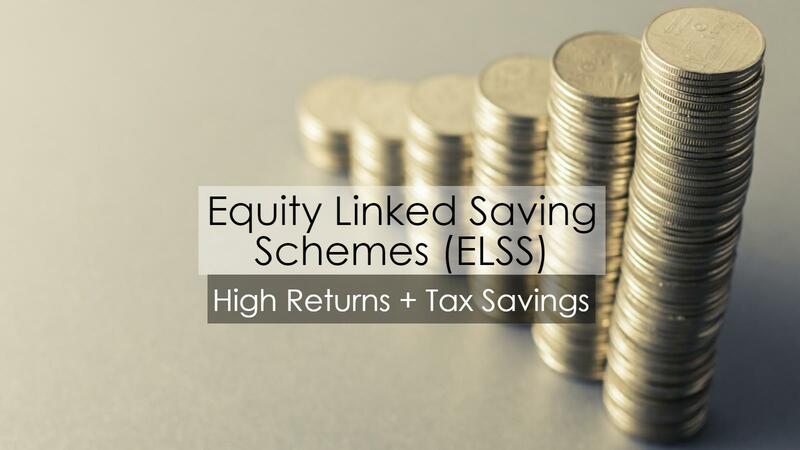 There are some of the important features of Equity Linked Saving Scheme or ELSS funds. Equity Linked Saving Scheme or ELSS fund is one of the best tax saving investments. There are various benefits of investing in this investment option. The lock-in period for ELSS is the lowest among all tax saving investments. The majority of investment is made in equity in Equity Linked Saving Scheme funds. The equity-oriented investments involve a great risk. But you cannot ignore the fact that those investments which involve greater risk also promise higher returns. The lock-in period of Equity Linked Saving Scheme or ELSS funds is of 3 years. Another benefit of investing in ELSS funds instead of other tax saving investments is you can stop investing whenever you wish as there is no compulsion to make further contributions. There is no maturity date for Equity Linked Saving Scheme or ELSS funds. That is why investment and tax experts consider ELSS as one of the best tax saving investments. You can make an investment in Equity Linked Saving Scheme or ELSS funds via online medium or offline medium. The best thing about this investment option is that you get the flexibility to invest. You can make an investment through an SIP or in a lump sum. SIPs allow you to invest a fixed amount every month. SIPs save you from investing a big amount of money after the financial year to meet the requirement of section 80C of the Income Tax Act. You can invest a small amount of money every month to avail the same tax benefit after the completion of the year. The benefit of Equity Linked Saving Scheme or ELSS funds is that you can make an investment through an SIP. That is why it is one of the best investment options present in the Indian market. Equity does not give you good returns in the short run but you get good returns from equity when you invest for a long term. Equity is the only type of asset classes that can help you to earn higher returns beating inflation. • What is Equity Linked Saving Scheme or ELSS? • What are the important features of Equity Linked Saving Scheme or ELSS funds? • What is the lock-in period of Equity Linked Saving Scheme or ELSS funds? • Is there any maturity date for Equity Linked Saving Scheme or ELSS funds? • Do Equity Linked Saving Scheme or ELSS funds provide an opportunity to diversify and switch funds? • How could you diversify and switch your funds in Equity Linked Saving Scheme or ELSS funds? • What is the benefit of investing in Equity Linked Saving Scheme or ELSS funds through an SIP? • Why Equity Linked Saving Scheme or ELSS is one of the best tax saving investments? • Give five reasons for why you should give preference to tax saving investments such as Equity Linked Saving Scheme or ELSS funds. Then you are at the right place, please do scroll up the page to get answers to all of your questions.